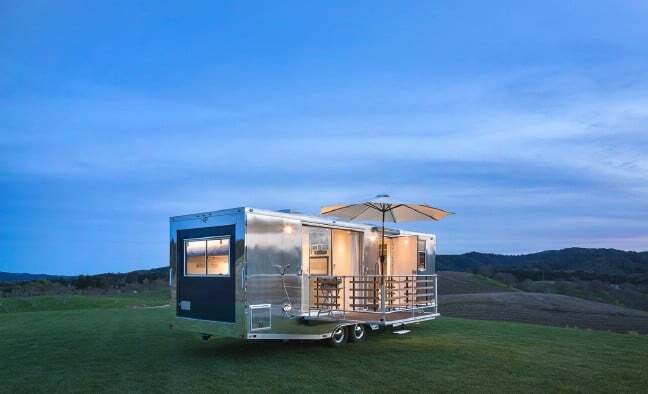 I often say that recreational vehicles were the original tiny houses. I live in one, so I know what I’m talking about here. 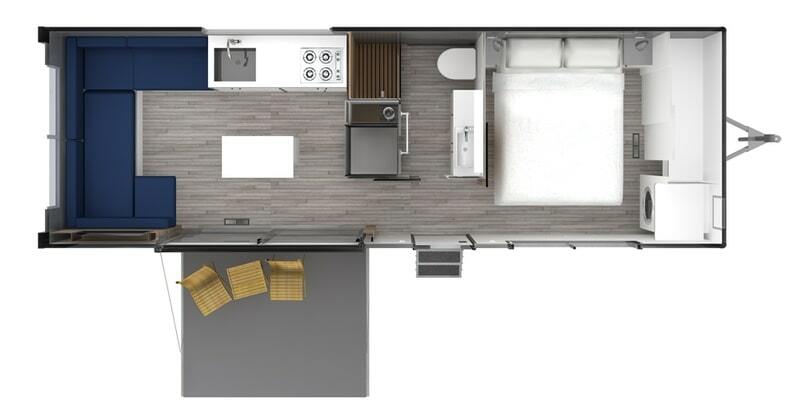 A lot of modern tiny houses even feature roughly the same layout, just with the addition of a loft, more polished finishing, and a more “homey” look and feel. 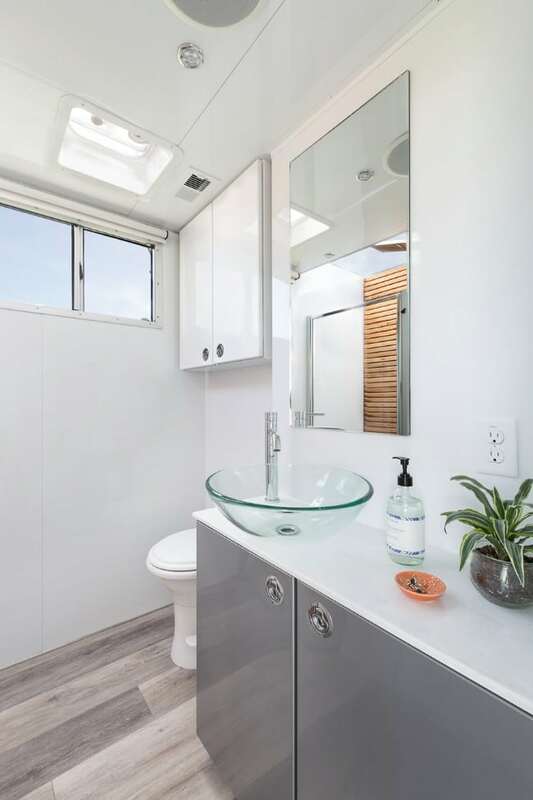 Many of Hofmann’s projects are refurbished, upgraded Airstream trailers. Following suit, the Living Vehicle features a metallic build. I can tell you that not only does this look cool, but it also has some functional benefits. 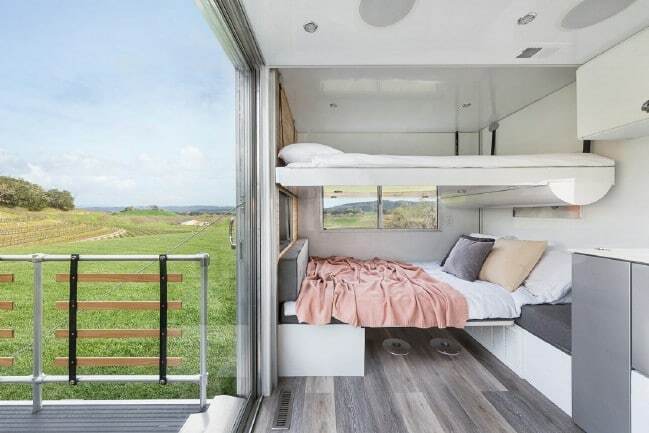 Wood rot is a major problem in many RVs, and it can affect tiny homes too. The metal body eliminates that particular issue. The predominant color used in the interior is white. 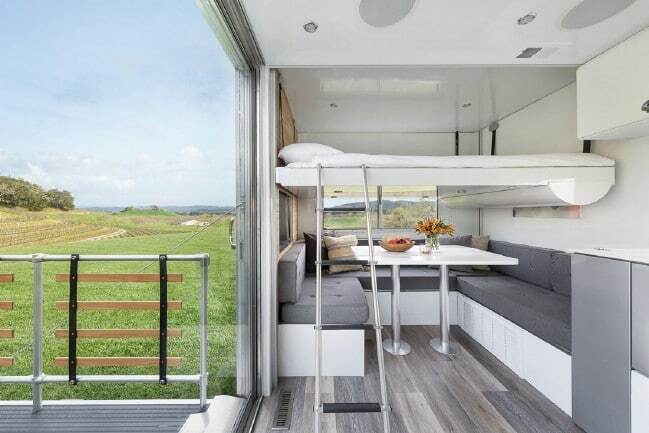 Together with ample skylights and windows, this keeps the space open and airy. A well-situated mirror creates an illusion of more open space in the seating area while simultaneously dividing up the space. Turning to face the other side of the room, we can see a washing machine on the right, and a large closet on the left. 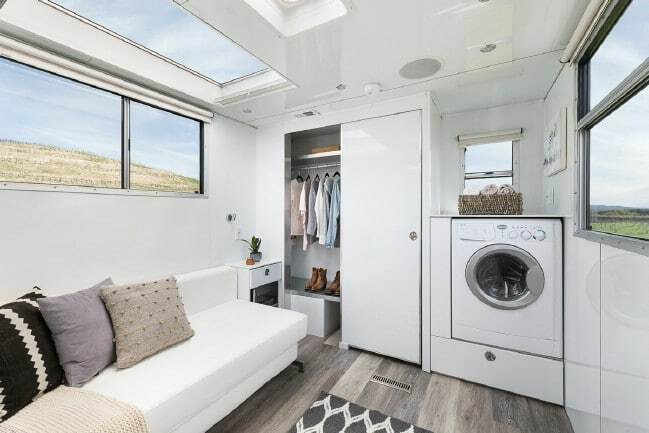 Fitting closet space into a small vehicle like this is no easy task, so I am impressed by the sheer amount of room for clothing, shoes, and accessories. In this photo, you can see how the room is transformed when the closet doors are closed and the sofa is expanded into a full-size bed. 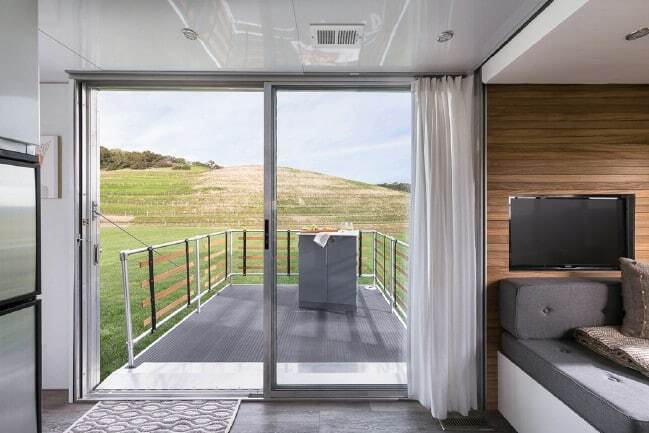 Rooms like this which serve double duty can add functionality to a tiny house without tacking on more square footage. The bathroom has the same understated elegance as the rest of the house. Once again, white is the main color, and a skylight brings in additional light through the ceiling. 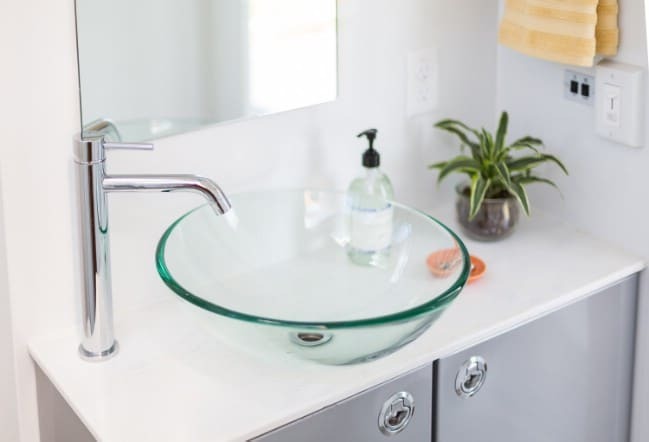 The glass bowl sink not only adds an artistic touch, but also helps to maintain the sense of openness. 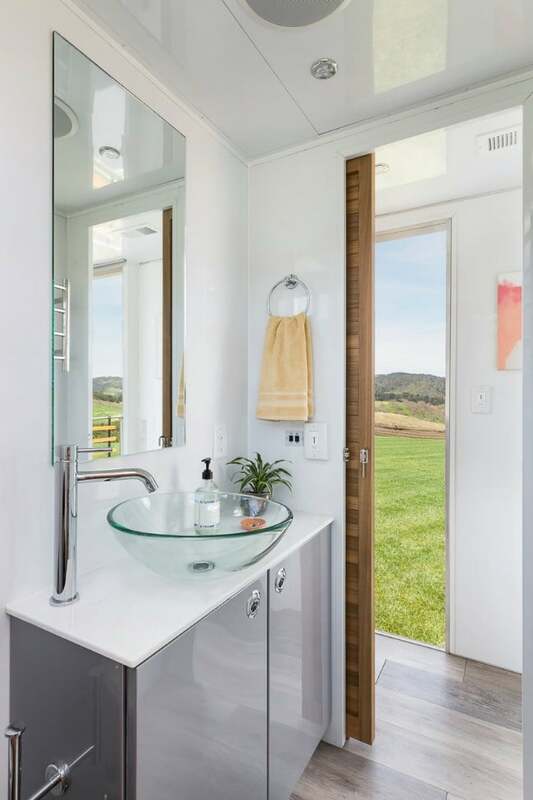 The shower stall is itself a work of art, and features a rain shower head for a luxurious experience. You can step from the bathroom right outside! By the way, notice the glossy finish on the walls and furniture in the home. This complements the shiny metal exterior and provides for a modern atmosphere. 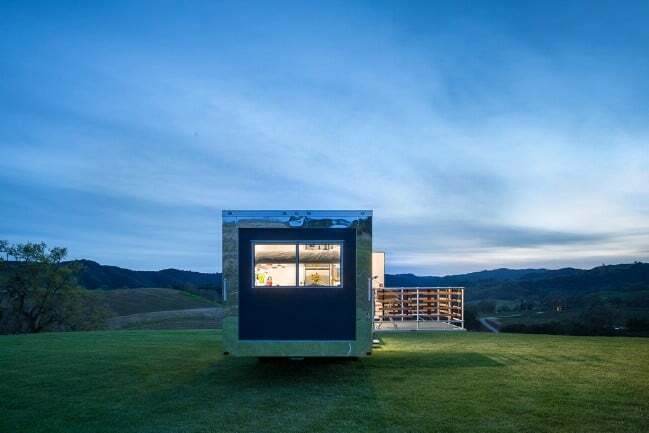 In tiny house design, there is a tendency to focus on the kitchen. 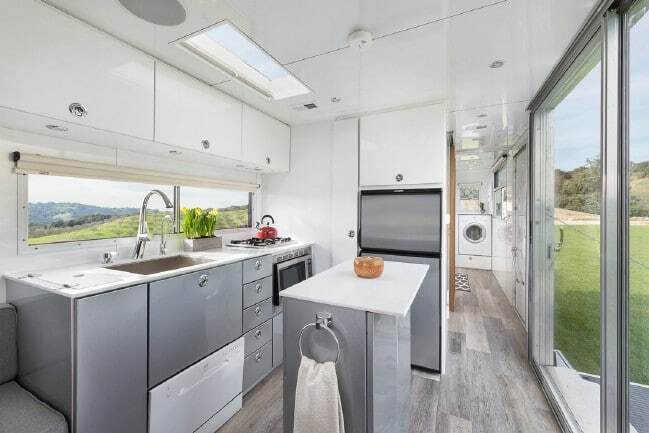 This is partly because we spend a lot of time in our kitchens, but also because the kitchen usually is right in the center of the home (another aspect of classic RV design which has become the norm in newer tiny houses). 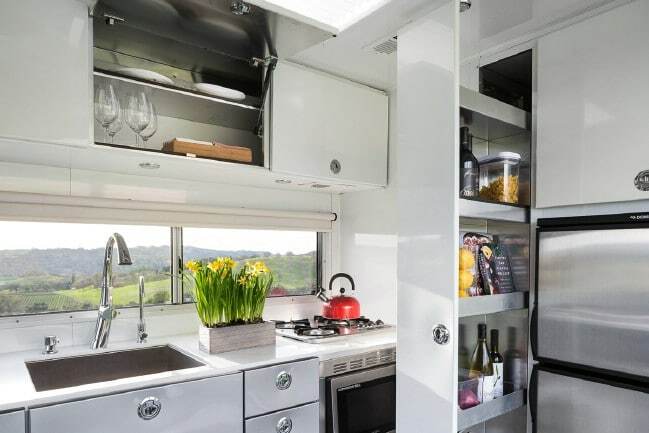 The kitchen in the Living Vehicle certainly doesn’t disappoint. With a panoramic window over the sink and huge glass doors across the way, it is full of daylight and offers fantastic views outside. You have everything you need to prepare your meals here. 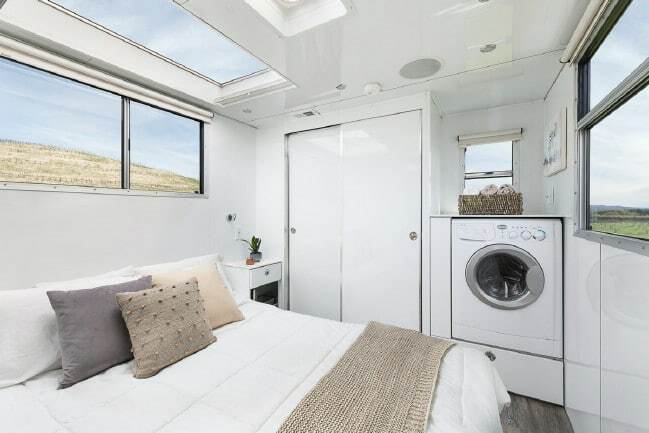 There is an oven and cooktop, a deep sink, a fridge and freezer, and some cleverly-integrated pantry space which literally slides in or out of the wall as needed. A large patio makes the most of the outdoor space available. You can also see here where the flat-screen TV has been mounted in the wall. It looks to be situated at a comfortable viewing angle. Wow! The table on the bottom can also be transformed. Now there are two beds to sleep in. In the image below, you can see how all of these components fit together in the layout of the home. 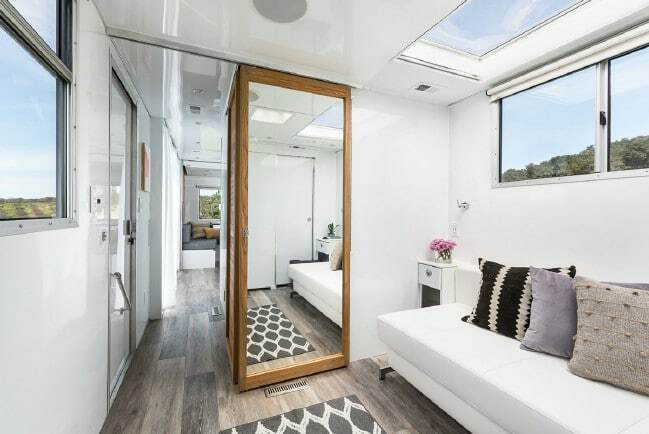 All in all, this is a very impressive living space, one which any tiny house enthusiast would be happy to call their own. I suggest taking a look at the detailed specifications, which you can find here. At the site, you can also explore and discover more about the Living Vehicle, or contact the architects if you would like to purchase one of your own.